Lights Out Review | Nerd Much? Horror films are a difficult genre to make work in this day and age, as it can seem like almost every single concept has been exhausted or beaten into the ground. Yet, most of the time directors or studios forget it’s not the gimmick that makes a good horror film, but the execution. 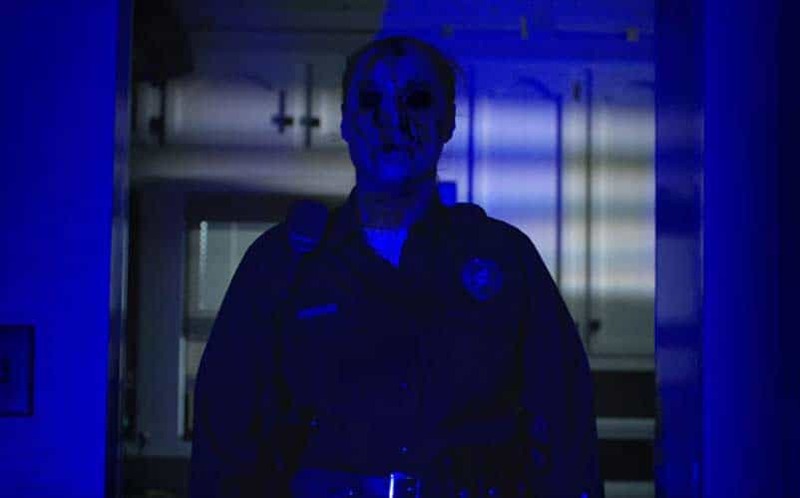 Enter Lights Out a scary movie with a fairly novel idea that probably had many of you rolling your eyes as it tried to sell itself on James Wan acting as a producer for this movie. Which, let’s be clear here, a producers attachment to a film doesn’t always guarantee that same quality you’d expect if say, they directed it themselves. 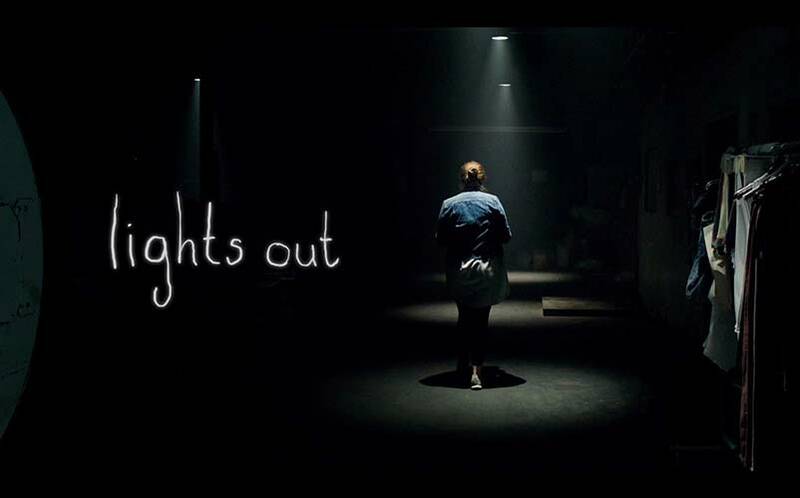 Yet, despite the poorly put together trailers and overly simplistic concept, Lights Out is an entertaining horror film that has some of the best acting I’ve seen in this genre in recent memory. 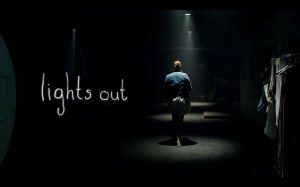 Lights Out follows the story of a broken family that has seen the loss of both their father and stepfather due to unseen circumstances. One of them decided to abandon the family all together while the other “mysteriously dies” while working overtime at his factory. (Seriously this is within the first ten minutes, it’s hardly a spoiler, set that keyboard down.) The older sister Rebecca (Teresa Palmer) is off living with her boyfriend Bret (Alexander DiPersia), while her unstable mother Sophie (Mario Bello) is taking care of her son Martin (Gabriel Bateman). The heart of the story is Rebecca and her mother’s estranged and damaged relationship, which seems to be pouring out onto to Martin. Sprinkle in a nasty ghost tormenting them and most of the film being set in the creakiest house ever, and the story pretty much tells itself. Lights Out smartly takes the time to fully develop all of these characters, including ones such as the boyfriend which is a character that’s normally pushed aside or used as an excuse to add another body. All of the characters feel lived in and much of this is thanks to the wonderful acting from the cast. It also deals with issues such as depression, anxiety, and loss in deeper ways than you’d expect from a horror movie. Most of this is thanks to the great acting from the cast, but the sharply written script does a nice job balancing most of these issues. Palmer delivers her best role yet, as Rebecca is balanced in her emotions, not wavering to plain old scream queen or helpless horror movie victim. You can tell she is resourceful and understands the peril she is currently in. A lot of this is also thanks to Bello’s great portrayal of her mother, who was a character that took a bit more time to grow on me. The mother and the spirit have a deep connection to each other which could easily just force the actress to play her as zany and off the walls as possible. Bello smartly reels it back with Sophie, giving her madness a layer of subtly to it with a variety of ticks. Though she may be the oddest of the living characters, her portrayal doesn’t stand out as a red flag or disrupt the tension being built. Though the real star of this show is Diana (Alicia Vela-Bailey) the malevolent spirit that has come back to haunt this family. Her boney, raggedy frame makes her instantly recognizable among the shadows and Vela-Bailey’s performance is spine-chilling at times. Diana stands out among other spirits thanks to her interacting with the mother and family quite regularly and in full form. She doesn’t spend an hour beating around the bush waiting to be discovered, in fact, this ghost is quite brazen about letting others know who she is. This not only helps Diana feel fresh and different but cuts some of the most annoying sections a typical ghost movie has to jump through. Sure, there is time spent where some characters need a bit of convincing, but overall she is acknowledged as a problem early on. Doing this helps the pacing of Lights Out drastically and keeps the scares going throughout. However, if you aren’t a fan of jump scares this will not be the movie for you. Director David Sandberg relies a bit too heavily on this, as many of the “terrifying” moments boil down to Diana jumping closer to the screen when the lights on or a big spike in loud noises to jolt the audience awake. Which is a shame, because there are some genuinely well-composed scenes in Lights Out. This robs some of the tension as you won’t be able to really engross yourself into the world due to the constant barrage of shameless jump scares that are substituting for building real fear. Sandberg rarely takes his time in any significant way to build up a scare and they all rely on the same concept. Diana’s actual story is also a principle problem due to Sandberg never actually explaining what she wants with the family. Yes, we know why she exists and how her gimmick works thanks to a magic box of exposition that just happens to be sitting around in their house, but she isn’t explored. Outside of just trying to exist, there isn’t a good reason given as to why she needs Martin or wants to torment him. Diana is just doing it for the sake of doing it and that robs a lot of fear from her because we don’t know her motives at all. Though this could be seen as scary, a lack of reasoning for violence, this concept is never explored and thus doesn’t work well within Lights Out script. That all being said, this is a good horror movie that delivers some wonderful performances and different takes on classic horror tropes. The acting and design for the monster Diana is terrifying, which is boosted by the well-composed shots and sound design. However, a heavy reliance on jump scares and lack of actual motivation for Diana makes Lights Out the second best horror film of the summer. Sorry Sandberg, The Conjuring 2 is still the reigning horror king of 2016. But if you need a good scary movie, Lights Out is a bright spark of electricity in a normally dull and dark genre.